So what exactly is Google Buzz? 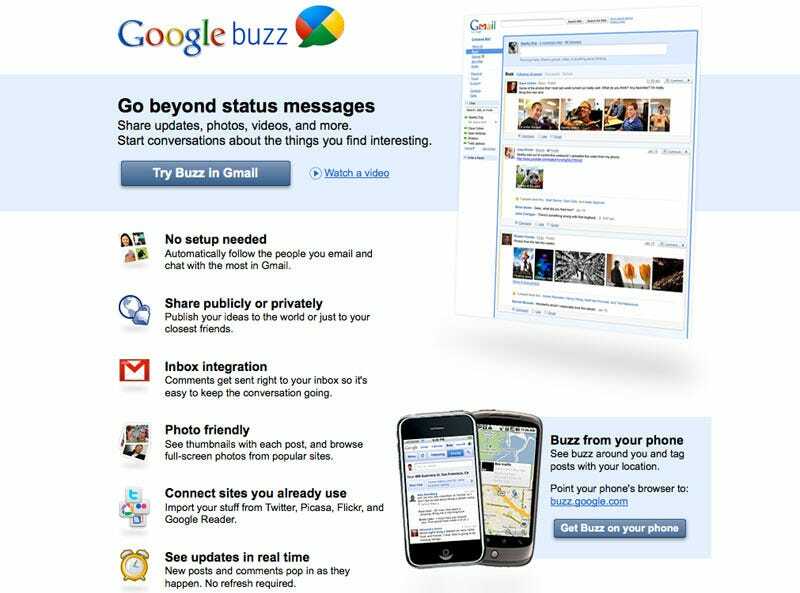 Used on a PC or mobile, Buzz reminds us of an RSS combined with all of your social networking—all within the existing Gmail and Google.com infrastructure. • "Recommended Buzz" puts friend-of-friend content into your stream, even if you're not acquainted. Recommendations learn over time with your feedback. Google Buzz is available today, and it should creep up as a new tab in Gmail any minute. But What About My Cellphone? Here's what Buzz looks like. First, the text box. No obvious word limit, as far as I can see. Don't go dumping huge articles in here, but you can fit more than Twitter. Once you click in, you can add links, photos and decide whether or not you want a private or public Buzz. The Buzz listing looks more like Facebook than it does Twitter, with Likes, dislikes and the ability to respond directly to a posting and have other people see it. When someone makes a new comment in reply to an old Buzz, it bumps that entire Buzz up to the top. What's weird, and what Matt and I can't figure out yet, is how some people are able to find us on Buzz. Is it searching by real name? It's also interesting that this is tied to your Gmail account. When people do a search for you, it doesn't seem like it exposes your actual email address, which is a good privacy protection wall.